IS THIS SEDONA I SEAT FOR YOU ? In the Highest Line of Comfort Seats Available. 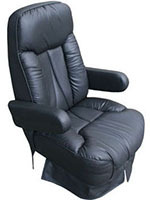 High Density Foam Main Seat Cushion with Contoured Foam Construction. High Resilience Foam for Long Trips Available. 7 Spring Options Available for Larger People.